Flare For Ivory winning his trial for the Grade 1 Ruidoso Futurity last May. AURORA, CO�JULY 8, 2015�Three 2-year-olds by leading sire IVORY JAMES will compete in the $148,000 Rocky Mountain Futurity on Sunday (July 12) at Arapahoe Park. The race will contested at 350 yards. Whoo Dat, a son of Ivory James racing for owner Carry Allred, posted the second fastest time in the June 25 trials. Under jockey Russell Vicchrilli, the Oklahoma-bred gelding completed the 350 yards in :18.051 seconds. Tomey Swan conditions the Rusty Allred-bred runner from the Pritzi Dash mare My Mighty Moe. Whoo Dat has won two straight races and will be looking for this third win in five starts on Sunday. Kyle Hause's Lett Her Bea qualified with the fourth fastest time of :18.077 seconds. Also ridden in the trials by Vicchrilli, the brown IVORY JAMESfilly was making only her second career start for trainer Hipolito Michel-Valverde. Bobby D. Cox bred Lett Hre Bea in Oklahoma from the Shzoom mare Lett Her Zoom. Flare Of Ivory finished with the fifth fastest time following an impressive 1� length trial victory for owners Hugo Barron Sierra and Marguerita Melendlez. Jose Manuel Barron trains with Adrian Ramos getting the riding call in the trials. He has won two of five starts and earned $9,130. 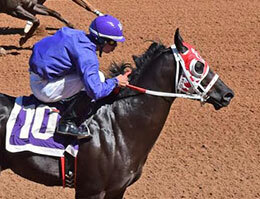 Flare Of Ivory won his Ruidoso Futurity trial and finished fourth in the $50,000 Ruidoso Juvenile Invitational on June 7. He was also fifth in the West Texas Juvenile Invitational in April. Vaughn and Jill Cook bred the son of IVORY JAMES in Oklahoma from the Special Effort mare Special Phoebe.